My Grandfather had two cattle ranches and farms where he raised cattle, crops as well as having pecan orchards. As a result of having the cattle ranches, we had the best beef available for our own consumption. My grandmother mastered their favorite steak preparations from the many steakhouses they visited when in Texas and other areas of Louisiana for rodeo's and auctions. Her motto, and obviously the restaurants too, was to keep it simple. Forget the ketchup, A-1 Steak Sauce and marinating your steak in salad dressing. That's for amateurs! There are two ways they favored their steaks. 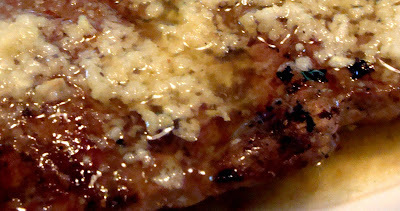 This one is my favorite, Grilled Steak with Garlic Butter. You can use any type of cut but my preferences are ribeye's and filet mignon's. These simple ingredients bring out the flavor of the steak without masking it and are incredibly delicious. Press the garlic and mix it in with softened butter. When your grill is prepared and ready, grill your steaks on one side until ready to turn. After turning, sprinkle the cooked side with salt and pepper. Allow other side to cook and turn again. Sprinkle it with salt and pepper. Once your steak is cooked to preferred doneness, flip again and spread a coating of garlic butter over the top of the hot side you just turned up. Remove from grill and flip it over onto the plate. Spread other, hot side, with garlic butter. Allow to sit 5 minutes before serving. If there is any garlic butter left over, I either use it to butter some French bread or throw it in with some vegetables or on a baked potato. Mmmm, Mmmm, good!